Part-IV elaborates on the three pillars of the SSSO – Love, Service and Sacrifice. Bhagawan says - To become deserving of God’s Love you must love others. He encourages us to aspire to be Sevaks (servants) and in the process attain the position of leadership, but not run after the aspiration to become leaders directly. Bhagawan quotes the famous Vedic dictum “Na Karmana Na Prajaya Dhanena Tyage Naike Amrutatva Maanashuhu”, stressing that through sacrifice alone we can attain immortality. The seven audio extracts in this posting are taken from the Discourses delivered by Bhagawan in the years 1975, 1980, 1984, 1985 and 1999. 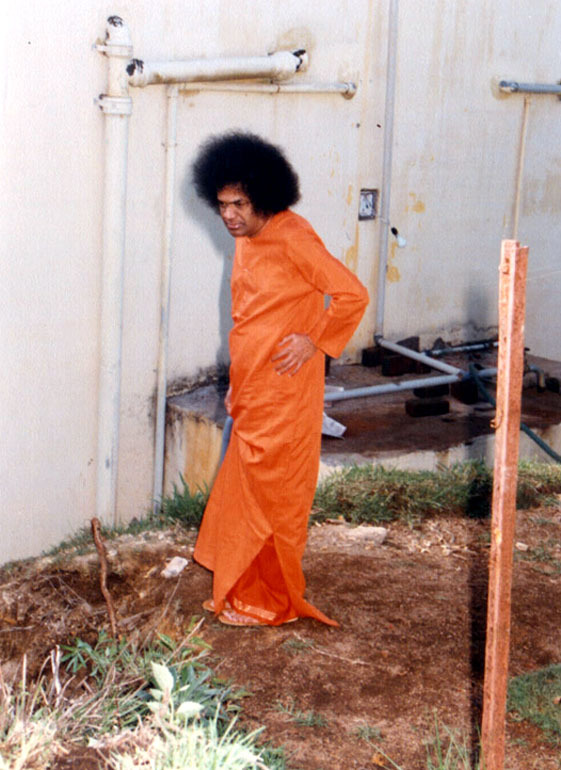 In Clip-1, Bhagawan says that Seva (service) is the primary Sadhana (spiritual practice) and to become deserving of God’s Love we must love others. Seeking for one’s own redemption is the greatest selfishness and one must sacrifice this selfishness. Clip-2 advises all members of the SSSO to aspire to be Sevaks (servants) and not crave for leadership positions. Clip-3 highlights the importance of sacrifice. 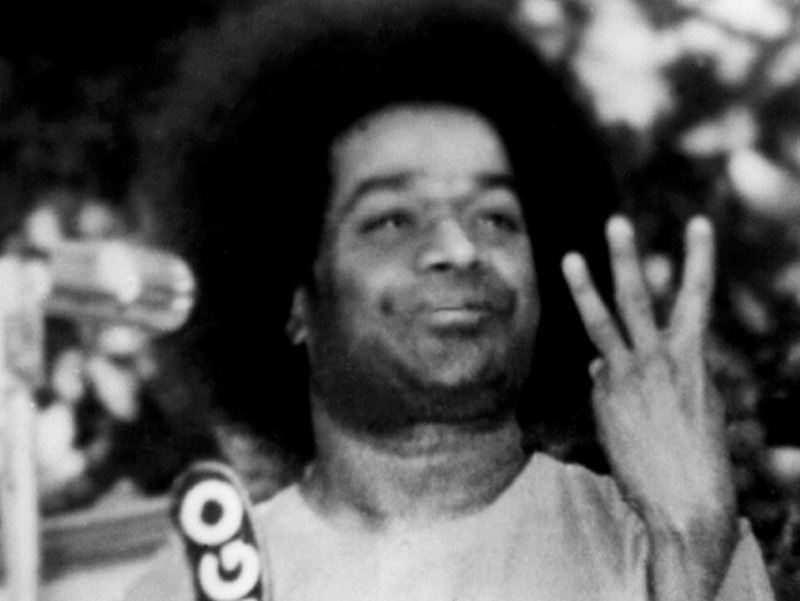 In Clip-4 Bhagawan reminds us that in matters of service, no differences of any type must be entertained. Clip-5 talks about the need for members of the SSSO to be ready to undertake any Seva, without any feelings of mine and thine. In Clip-6 Bhagawan urges that every devotee family must take up the responsibility of feeding and nurturing one poor person. He says that there can be no greater act of charity than feeding a hungry person. Finally, in Clip-7 Bhagawan praises the members of the SSSO who offered yeoman selfless during the festival of Pushkar. Merely reading the texts and listening to Discourses cannot make an impact on the heart. To touch the heart and make an impact on it, one must engage in service. One who does not undertake service has no right to talk or preach. Therefore, to acquire the right to speak, one must necessarily engage in service. Seva is the primary Sadhana. To whomsoever we serve, we must regard that we are serving God. We must consider that we are undertaking all activities to please God. The main aim of the Sathya Sai Organization is to develop this type of Love. While merely closing the nose and doing worship, or trying to get intoxicated in meditation, or getting lost in ecstasy while singing Bhajans; if there is no sense of sacrifice in these, then they become mere symbols of selfishness. Therefore, to aspire for your own redemption is the greatest selfishness. To desire for your own destination is the greatest selfishness. To seek for your own happiness is the greatest selfishness. One who sacrifices this selfishness and loses oneself in the feeling that others’ joy and happiness is one’s own joy and happiness, is a truly selfless person. One who loves others alone will be loved by God. To become deserving of God’s Love you must love others. If you want God to love you without you loving others, it is impossible. Therefore, you love others and God will live you. Thus, understand this principle of Love; forget the past to the extent possible; do not worry about the future and make an effort to experience the present in the best way. Embodiments of Divine Atma, the Sathya Sai Seva members, the Sathya Sai Sevadals, the Sathya Sai Seva Samithi, the Sathya Sai Balvikas – all these are always associated with the word Seva, Seva, Seva. Therefore, we must always aspire to be Sevaks (servants) and in the process attain the position of leadership, but not run after the aspiration to become leaders directly. If we enquire into the situation correctly, we find that in the Western countries, the one who is a Sevak today becomes a leader overnight. She/he becomes a leader or a Guru. You can imagine the harm that such Gurus can bring about. Therefore do not think about becoming Gurus, always entertain the noble thoughts of being a Sevak forever. All people and specifically all members of the Sathya Sai Organization must enter into service activities. We must nurture sacrifice, sacrifice, sacrifice. There are so many wealthy and rich people. They are rich only for name sake but there is no sacrifice in their action. They do not even perform the meritorious act of giving somebody a glass of water. No, no. This is not human life. Sacrifice, sacrifice and sacrifice. Therefore, the Vedas have proclaimed, “Na Karmana Na Prajaya Dhanena Tyage Naike Amrutatva Maanashuhu” (Not by action, not by progeny, nor by wealth; it is by sacrifice alone that one can attain immortality). We must attain this form of immortality. In the matter of service and bending your body and working, no differences of any type must be entertained, either by the members or the seniors of the Organization. When it comes to service, without having any differences in your mind, in a collective manner, considering all as the children of God; you must provide help and support. All the material objects in the world that give you comfort and joy are not for the use of one single individual. All have a right to it. Each one should put in an effort to experience her/his share of it. It rains, the river flows, the crop grows, the sun and the moon shine; all these activities are not meant for any one single individual. We must recognize the truth that each one has a right to experience these joys and comforts. The Sevadals must strive to remove the narrow minded feelings of “this is mine” (mine) and “this is yours” (thine). They must give up narrow minded ideas, must be contented with what they get and must help others with a sense of gratitude. They must understand that this is the true form of Worship. They must recognize that not just living in a united way, but also striving to engage in community service, is true individuality. The Sevadal members must lead life with the broad feeling and understanding that whatever joy and peace they aspire for in their life, the same must be available to their fellow beings also. In life, we come across a number of challenges. Without yielding to any of these challenges, overcoming all of them, without allowing them to come in the way of one’s Seva, without getting vexed with the society in any manner, without giving any scope for ego or ostentation, with all humility and obedience; the Sevadal members should be ready for undertaking any Seva activity. It is this courage and conviction of purpose that you must have, to overcome the obstacles in the path of your Seva. In this conference, we must adopt one new practice. In this country there are so many poor people, forlorn people, sick people and others who are challenged in different ways. Each family must be prepared to nurture one poor person. Each family must offer food and protection to a poor person, thus preventing her/him from going to the market place to beg for food. Each family must welcome and offer food to at least one poor person every day. In this country that has assumed the form of Annapoorneshwari (Goddess of Food), if there is no one to feed the people who cry out, “Annamo Ramachandraha” (Oh Rama give me food), how then, can we call this country as Annapoorna Kshetra (land of the Goddess of food)? Therefore, the new sacred practice from tomorrow must be that, every family (not every individual) must welcome and serve food to one poor person every day. Giving food to a hungry man is the greatest Sadhana. Some people cause lot of trouble to their parents at home but they go out and preach to others. Conquer the home and then conquer the wider world. First nurture and worship your own parents. Please them first. Sujana Sangatikanna Chooda Laabham Edi? Of all these sacred aphorisms, the most sacred one is “Annadaanamukanna Adhika Daanam Edi?”, i.e. there is no gift greater than giving food to a hungry man. Annam Brahma. Therefore, when a poor person comes and stands near our threshold, and cries out “Amma Annamu (Mother, give me food), I am feeling hungry”, the heart that attempts to welcome her/him is the truly generous heart. Here we have to note one more point. Because Swami said like this (Kotha Vinta Paatha Rota – when you hear something new, the old practice becomes foul), some women will immediately go to the Bazaar (market) and start distributing food over there. Do not undertake such a practice and encourage beggars. This will result in more harm than good. The person next to us should not know whom we are nurturing or whom we are giving food to. I wish that without any such ostentation, we must promote brotherhood and sacred Divinity through practice, in our organization. Not just that, in many parts of the organization (SSSO), right from young children to old people; all of them are doing so much Seva. Selfless service can be seen only in the SSSO. In Bharath, a few months back, in West and East Godavari, the Pushkara festival was celebrated where lakhs of people congregated (Since time immemorial, river worship, known as “Pushkaram”, is performed to make people realize the importance of water, the life-sustaining force. Pushkaram is a holy happening once in every 12 years at each of the 12 major rivers of India, the Godavari being one among them. Every 12th year Jupiter’s entry into the constellation Leo marks the Pushkaram for Godavari). Even in Krishna district, thousands of people assembled for the Krishna Pushkara. The Seva done by the men and women over there is something that only the eyes which have witnessed it can understand and not the fools who only speak. God alone is the witness to the tolerance exhibited by them to all the impurity (dirt) around and to the sacred seva done by them in cleaning and sweeping the place. As Swami’s Birthday is drawing closer, many members of the organization, in places like Dharmavaram, Guntakal, Kurnool and Bagepalli, who have been waiting with great desire, considering that service to the devotees of Swami is the real Seva to Swami, have been offering lot of service to the ongoing travellers (to Prasanthi Nilayam). Service to man is service to God is merely stated in political organizations, whereas in the Sathya Sai Organization, this assumes a true form. 01-Why does Bhagawan call service an important pillar of the SSSO? 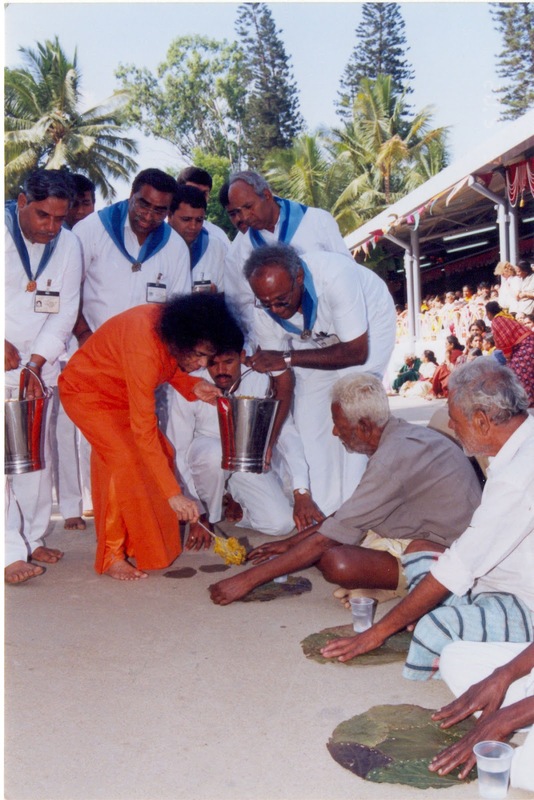 02-How according to Bhagawan, must one perform Seva (service) activities? 03-What is the type of sacrifice that Bhagawan wishes the members of the SSSO to undertake? 04-How according to Bhagawan, can we become deserving of God’s Love? 05-What is the meaning of the dictum, Na Karmana Na Prajaya Dhanena Tyage Naike Amrutatva Maanashuhu”? 06-What does Bhagawan expect when He asks the members of the SSSO to remove all the feelings of “mine” and “thine”? 07-With what qualities and framework of mind, must the Sevadals be ready to undertake any Seva? 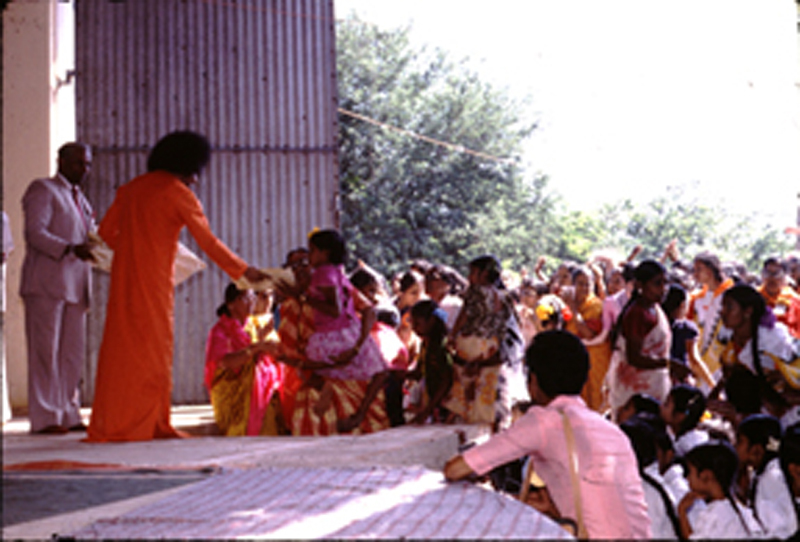 08-There is no greater charity than feeding a hungry person – In this context, what is the noble practice that Bhagawan initiated the members of the SSSO into? 09-Who is the greatest God in this world? 10-What is the most Truthful character or the best way of adhering to truth? 11-What is the greatest Dharma in this world? 12-What is the greatest profit / benefit in this world? 13-What is our greatest enemy in this world? 14-What is the greatest disease that inflicts mankind? 15-What is the worst type of death that can devour man? 16-What is the greatest wealth that man can accrue? 17-What is the caution Bhagawan asks us to exercise in taking up the new initiative of one family feeding one poor person? 18-What is the significance of the Pushkara festival and what is the history behind its celebration?